Review ICC World Twenty20: India & England. They were champions of the inaugural edition of ICC World Twenty20 in South Africa. They crashed during the next edition in England. Somewhat similar was the story in West Indies. They did well in Sri Lanka in 2012 but were ruled out of the tournament when the Net Run Rate was more in the favor of Pakistan. They reached the final of the 2014 edition in Bangladesh but Sri Lanka proved to be the better side in all departments on the big day. Now comes 2016. The fact of paramount importance in this year's edition is that the world event is being played in India which by it's own nature make the hosts as front runners. Having said that, the team will have to prove it's metal in front of the home populace. Indian team after winning the World Twenty20 in 2007. From the first edition of the ICC World Twenty20 in 2007 to the sixth edition in 2016, nine years have passed. India's performance has experienced all sorts of variations. But one pillar has remained constant in spite of all the variations. Even more constant than that of a problem in algebra. Mahendra Singh Dhoni will play in his sixth edition as the captain of the side making him the only captain to lead a team in all six editions of the T20 World Cup. Leading a national team for nine years is an achievement in itself, leave aside the batting and wicket-keeping abilities. The Indian team, under Dhoni would be looking to grasp every positive from his bank of experience. Not only the home conditions would aid Dhoni and his men. Their recent form will act as the biggest evidence to prove that they are the most settled unit at the moment. With 9 wins in the last 10 T20Is over the past one and a half month, the team has done no wrong on the field. Shikhar Dhawan's return into form in the final of Asia Cup makes the top order more dynamic. No one can ignore the fact that the Indian batting unit clicks often if the top order clicks. The top order which comprises of Dhawan, Rohit Sharma and Virat Kohli. Neither can one ignore the supreme primacy of Kohli and Sharma. Both of them have proved their prowess over and over again irrespective of the conditions or the opposition. The ever so strong top order will be followed by India's T20I specialist, Suresh Raina. Raina will bat at No. 4 which gives him time to settle and then go for the big shots. Not only batting, Raina can also be handy with the ball in hand. Yuvraj Singh was included in the team for the T20Is in Australia. He didn't get enough chances initially as the top order scored runs in bulk. When he got chances, he looked a bit patchy. But that happens to you if you return to the international level after almost 2 years. But now, he has come into his own self and has shown the world that he still can hit the white kookaburra to all parts of the ground. The skipper, MS Dhoni might have experienced a slight contraction in his big hitting abilities but he still remains one of the best finishers in the game. I doubt if any bowler in the world would doubt his. It may be too early to say but India's long wait for a fast-bowling all-rounder can be over in the form Hardik Pandya. With whatever he has achieved in his short T20I career, his will to take the centre stage has impressed everyone. His package offers playing the role of a third seamer and using the long handle down the order. To support him in the fast bowling department, India have included two contrasting players. Ashish Nehra, 36, has made a comeback after the ICC Cricket World Cup 2011 and his recent performances suggest that he can bowl both at the starting and at the death as well. The other seamer, more of a sensation, is Jasprit Bumrah. The 22-year old from Gujarat can bowl yorkers at will. His sliding action adds more to his bowling. He, along with Nehra and Pandya form a decent pace attack. Not to forget, India have included Mohammad Shami as well in place of Bhuvneshwar Kumar. But whether Shami will play in the initial stage will depend on his fitness. If he does, Nehra may have to make way for him. To strengthen this bowling armory, India has world's best off-spinner in R Ashwin with them who can deceive the best in the business with his street smart variations. To accompany him is Ravindra Jadeja who can play the role of a lower order batsman as well, if required. Two youngsters, Jasprit Bumrah and Hardik Pandya will play a big role in India's fast bowling department. The best thing about this side is that players like Ajinkya Rahane and Harbhajan Singh will have to warm the bench. It is any captain's delight to have such players in the reserves. It will also be a great learning experience for the newly included Pawan Negi. Leave aside batting and bowling, this current Indian team is by far the Best Indian team ever when it comes to fielding which always remains an added plus for any team. So whether this Indian team will continue their golden run in T20I cricket and capture their second World Twenty20 cup after nine years will be interesting to see. The Englishmen were always criticized for not winning any world event in cricket. It was an irony that they couldn't rule the game that they started way back in the 19th century. But in 2010, under the leadership of Paul Collingwood, they won their maiden World Twenty20 cup. They stand a chance of repeating their heroics of West Indies. But the place has changed and more than that their team has changed. Eoin Morgan, 29, England's limited overs skipper is the sole player who represented the side in the World Twenty20 in 2010. This is a fairly young team. But their main strength lies in the presence of lot of all-rounders and T20 specialists. Alex Hales and Jason Roy will open the batting for them. Roy, despite of his indifferent form is expected to be preferred over James Vince because of his destructing abilities at the top of the order. It will become difficult for any bowling attack if both of these attacking players start to dictating terms. They will be followed by England's best batsmen across formats over the past year, Joe Root, who has proved that success in T20 cricket can not only be achieved by power and strength but also by playing textbook cricket strokes. Root can also bowl off-spin which might prove handy in Indian conditions. At no. 4, will be their skipper and another limited-over specialist, Eoin Morgan. The stylish left-handed batsman carries the potential to win matches for England on his own on his day. Ben Stokes has cemented his place in the middle order across formats for around a year now. Stokes, 24, bats left-handed and bowls right-arm medium-fast. Morgan would be keen to utilize all the services of this genuine all-rounder. Jos Buttler, England's gloveman, who may be promoted up the order if the situation demands is another assaulting batsman, more of another T20 specialist. He scored England's fastest century in ODIs vs Pakistan off 46 balls last year and since then has never looked back. England have two quality spinners in Moeen Ali and Adil Rashid. Ali, 28, who came into the side as more of a batting all-rounder has become more of a bowling all-rounder. He can bat up the order as well if England include another batsman in Sam Billings or uncapped Liam Dawson in the middle order. Rashid, also 28, offers a different genre of spin bowling. In the modern era, where leg-spinners are hard to find, Rashid has established himself as an England regular over the past year. His batting abilities can also prove handy down the order. 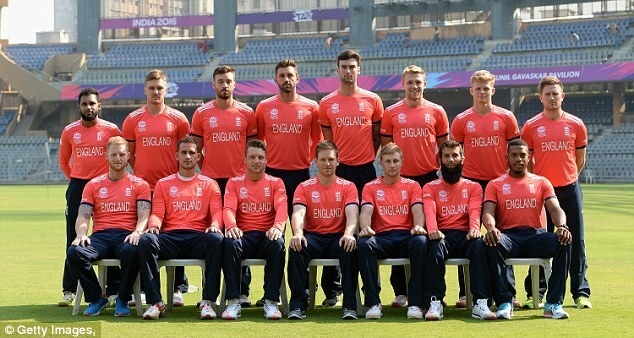 England team posing in Mumbai where they will face West Indies on March 16. One department where England has to play safe is fast bowling. They have the quality but consistency still remains a concern. After Steven Finn's injury rules him out of the world event, Liam Plunkett was included. Plunkett, 30, may have made his T20I debut in 2006 but till now has featured in only 3 T20Is. Chris Jordan, 27, is by far the most experienced English seamer (11 matches). The other options for England are David Willey, who at 26, has played 5 T20Is and Reece Topley, who at 22 has represented England 4 times in the shortest format. A combined total of 23 matches among your four fast bowlers does not count for much of an experience. But as they say, it's just about the four overs that you have to bowl in T20 cricket. It is likely that one of them would have to warm the bench. So, if any three of them can bowl 12 overs between them, it would be a boon for Morgan. The Favorites vs The Enhanced. A career tacked with injuries. India 1 - Pakistan 1. Spreading the Roots against South Africa. The Great Indian Batting Collapse.